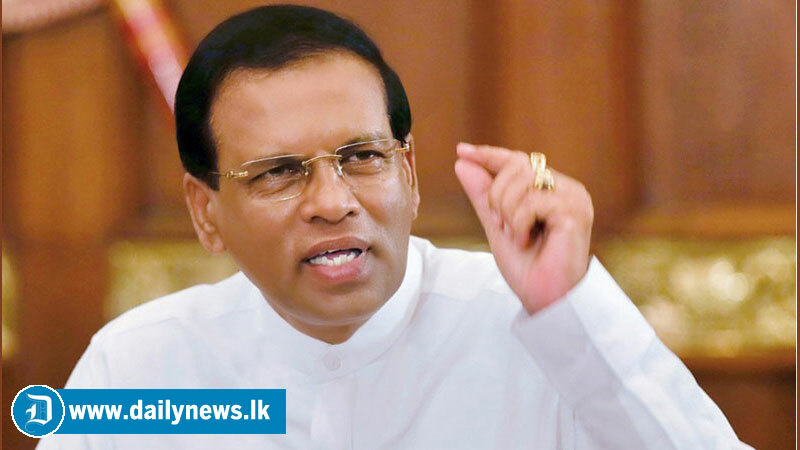 President Maithripala Sirisena appointed a five-member Commission of Inquiry (CoI), headed by retired Supreme Court judge Upaly Abeyrathne, to probe allegations of large scale corruption between January 15, 2015 and December 31, 2018. The Presidential Secretariat on Wednesday issued a Gazette Extraordinary with the President’s proclamation on the appointment of the Commission. The other four Commissioners of the CoI are retired High Court Judge Sarojini Kusala Weerawardane, retired Auditor General Pasdunkorale Arachchige Pemathilaka, retired Secretary to a Ministry Lalith R. de Silva and retired Deputy Inspector General M. K. D. Wijaya Amarasinghe. The commission is mandated to probe into the alleged “acts of corruption, fraud, criminal breach of trust, criminal misappropriation of property, cheating and abuse or misuse of power or authority, State resources and privileges” in the last four years by “persons who had held or continue to hold political office and those who have been or continue to be public servants and officers of statutory bodies”. In the proclamation, the President has requested the final report of the Commission within six months and the first interim report within three months. After the first three months, the Commission is expected to submit interim reports once a month. The President in his proclamation states that the new Commission is the next step of the PRECIFAC which inquired into the allegations of serious acts of fraud, corruption and abuse of power, state resources and privileges from January 10, 2010 to January 10, 2015. The PRECIFAC which was appointed on March 3, 2015 submitted its final report on January 2, 2018. The President said that the new Commission has been appointed as there are a large number of serious complaints and allegations, and that it is in the interest of public security and welfare to investigate into them. “The new Commission will help determine what measures should be taken to ensure that the law is appropriately enforced and wrongdoers dealt with in terms of the law, and that there will be no recurrence of such alleged acts amounting to offences and abuse or misuse of power or authority,” stated in the Gazette. The CoI is empowered to “call for and receive public complaints, information and other material” and “conduct prompt, impartial, comprehensive investigations and inquiries” into them. It is entrusted on identifying persons who have been or are responsible for committing the above mentioned offences, and collect evidence related to them. The Commission is entrusted on identifying which of the complaints should be forwarded to the Bribery Commission, Attorney General or any other law enforcement authority to institute criminal proceedings. The evidences before the CoI are not admissible before the courts of law. The President directs all public servants and officers to render their assistance and furnish all information required for investigations.